Want to be an asker for season 2 of AFAF? Read one line, then submit! You can do multiple voices! Askers are picked on Tuesdays or Wednesdays! If someone already applied for a part, try another one! WARNING! THIS IS LITTERED WITH SPOILERS FOR UPCOMING EPISODES! YOU'VE BEEN WARNED! Yep, I need a new Sans VA! I know Derpy usually does it, but I think having a new VA would make things a whole lot more interesting. Make sure your voice is deep and full of emotion! Kid. Frisk, you're talkin to yourself again. Don't. Don't lie to me, kid. It's that flower again ain't it? AIN'T IT?! I'd say go ahead and let Sans in on our presence. My guess is that he's suspected at beings from outside your reality existing before. Also if you ever need to pretend that we don't exist for a moment around other people I feel pretty sure none of us would actually be offended. You want to hear something even more impressive? Some of these points of light aren't even single stars, they are galaxies, meaning gigantic collections of stars so far away we can only see them as a single point. The universe is quite a bit larger than the Underground was. People have been up in space and have even set foot on the moon. We only have their word and so many pictures that looking back at Earth from up there with thier own eyes is life-changing. Just imagine it - the entire history of everything and everyone, all within the visual scope of a pale blue dot... and people seek to cross the vast distance between all these pale dots someday, despite the obstacles standing before them. Flowey's innocent for the most part! Frisk was talking to us! PLEASE! PUT HIM DOWN! Welp. This is too bad. Sans can't hear us. Oh no, Flowey try not to move or you'll fall out. Everything will be alright. Frisk won't let this last very long. So don't get too worried. Please. Sans, put him down! How dare you do that??? Bone head. Sans, you almost killed Flowey, why would you do that? Flowey go and talk to Sans. Flowey. . tell him the truth! Please say something . . you're slipping! You'll meet the same fate as the good doctor . .
Don't freak out Flowey, he's just here to talk. And even if he wasn't, it's not like Frisk wouldn't stop him or undo it. . . right? Ok, Flowey, stay calm. If Sans does something to you, Frisk would never forgive them. Sans would never do anything to you, right? Y'know if you ask for a bigger pot or a place to move around in, I'm sure Frisk would find one. It'd make things a bit more bearable for you at least. Okay, THAT'S IT. ENOUGH OF THIS! EVERYONE BACK OFF, YOU'RE ALL MAKING THIS WORSE. The surface is a cruel world, there are lots of things that could hurt a flower, they probably just want to keep you safe from them. I think it's time for a little break, man. Get some rest now. FRISK DON'T RUN TO YOUR ROOM! THAT'S WHERE FLOWEY IS! DON'T LET SANS SEE HIM! This may sound obvious, but Sans hates Flowey. Seriously? Trying to escape from Sans? What makes you think that's a good idea? If you really don't want to tell Sans, you could just reset. Frisk, this is gonna get bad. Frisk, please don't fight Sans! NOTE: The third ask is actually multiple asks! Do me a favor and don't rush it please. Flowey, be prepared to attack, I believe you said it yourself, did you not? Not only can he not be trusted, but it's truly kill or be killed. Don'tgive him the satisfaction, if he's gonna kill you, make the last thing you do spitting on his face. Nothing left do do but fight. . you can do it Flowey, I promise. Do it! You are NOT weak Flowey! Is that. 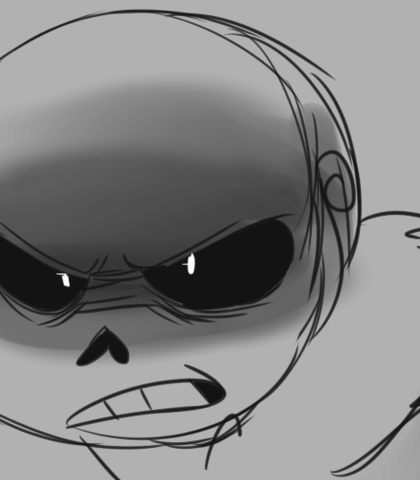 . . please don't tell me . . those are . .
STOP IT SANS! WHAT IS SANS DOING? OH GOSH SANS IS GONNA KILL FLOWEY! SANS NO! FLOWEY! Em...Flowey? What is he talking about? What did you do here? . . . Flowey? Flowey! You need to say something! This is the Core! Sans didn't bring you here by accident. If you die here. . you can't be brought back even through a reset!
. . . Just like Gaster . . . !!NOTE!! : Anything that says (SILVER) next to it is going to be voiced by my good friend SilverSlayer667. So DON'T DO THE ONES THAT HAVE (SILVER) NEXT TO THEM UNLESS YOU'RE SILVER.
! !SECOND NOTE!! : If something says (SANS) next to it, only someone with a Sans voice can do it. So DON'T DO ANYTHING WITH (SANS) NEXT TO IT UNLESS YOU CAN DO A GOOD SANS VOICE! Every night? This has been happening every night? Hey Flowey. It's going to be okay. It won't happen again. Which do you mean? The nightmares... or Toriel tucking in Frisk? H-Hey Flowey. How...How are you feeling? ...You look like you have been awoken from a terrible nightmare. Do you want to talk about it? Or do you need something to help you feel better? Ehm... would you like some warm chamomile tea? It's fresh-perked... Anything? Just say it and we'll get it for you, ok? He's over here. Huh, so he hasn't bolted. That's a good sign. Hey Flowey. I suggest you think carefully about what to do next. You've been given this chance out of trust, which is something you desperately need to build right now. You want a break? By all means, take a break. You've more than earned it. But promise you'll come back before it's time for Frisk to wake up. We'll alert you if someone else finds out you're gone. *Brings him outside and lets him into the ground. * There ya go. ... If you think about it this way, you're hurt. If you're scared, there is safety here. Okay? Sure thing pal. I think we should. It must be uncomfortable in that pot, and you had a really bad day. *Gently take Flowey out of the pot. * I'll let you out. But don't tell Frisk, okay? They might not let us back if you do. Where would you like me to set you down? Well... we should really be heading back... but I guess we can give you five more minutes. Flowey. I have a question for you. Why did you suddenly grow thorns when we brought you outside? Is it because there is, oh I don't know, maybe more nutrients in this outdoor soil than there is in your pot? I'm no botanist so I haven't got a clue. What kind of flower are you? Because I know that Asgore's garden had buttercups in it, but you look a bit too big to be a buttercup. Seriously, Flowey? You didn't know? Weren't there bunnies in Snowdin? I'm sure you've met them before... right? Um, sorry, Flowey, for comparing the two, but when we see something, we have a bad habit of doing just that. It makes it easier to remember and classify things for us. Like, "Oh, you see this lion? It looks kind of like a puppy if you squint" even though cats and dogs are not even remotely similar. Language Flowey! Whoa, I don't encourage that kind of language! Where did you... hear that?! The stars are beautiful, aren't they? It must hurt being stuck inside with them so near. Flowey, what do you think of the stars? Are they what you imagine them to be? Has Chara ever told you about them? *Sits down next to Flowey. * Hey Flowey, you see that big light? You've probably heard of it. It's the moon. Despite how it looks, it's actually round. It's just from the angle we're seeing it from right now, most of it is in shadow. It's enormous, a little over one-fourth of the Earth's size, but it looks so small because of how crazy far away it is. Yet, it's way closer to us than the sun, or any other stars or planets. It's beautiful, ain't it? All those suns so very far away, each with a world of thier own. Across the vast expanse of space, how many worlds contain life? Think of how many of the hundreds of trillions of stars could have an Earth-like worlds how many have intellegent life? how many could have a monster looking back at you from across the vast gulf of space? Truly we are insignificant and yet so very unique.. Uh, Flowey, I don't think you have to worry about stuff eating you. You're kinda extremely poisonous. Okay. How about we move on...? Is it night? I can't tell. If it is, why not look at the stars? Oooh! Flowey, a shooting star! That means you can make a wish! Is this the first time you've seen the stars since coming to the surface? A rabbit... There were some rabbit monsters back in Snowdin, but that's a surface rabbit! Uh, have you never seen a bunny before, or...? 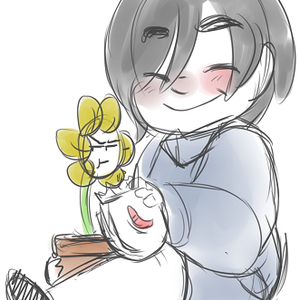 *Small anon gives Flowey a reassuring pet while the others shoo the bunny away. * Come on little buddy, it's gonna be alright... You okay, Flowey? No need to fear, it was just a bunny! That would be a bunny, Flowey. Normally I'd say you'll be fine, but you're a plant. Flowey... bunnies, well... eat plants. I heard Sans likes the stars a lot. He probably knows the constellations and everything. I know it's probably not what you want to think about right now, but... well, we can't stop him if he wants to hurt you again, hun. If you like the stars a lot too.. maybe that's common ground? You don't have to like him, but it seems prudent to convince him you're not a threat anymore at this point. Anything is possible. Flowey, if you really like the star, galaxy, or planet, why not ask Frisk to take you to an observatory to see a planet? Could be beautiful. So... what do you think about the surface right now? Look, not to ruin a nice moment here, but we should REALLY go back before Frisk notices. When you return home, maybe you can ask Frisk to take you on a walk tomorrow afternoon (if it's sunny, that is) so you also get to see the neighborhood in the daylight. Believe me when I sayy it, but the world looks completely different in sunlight. And seeing you now getting a taste of the big world was what you really needed. They take these big ships and go up into space, sometimes they land on the moon and go out in special suits to explore. Well they don't LOOK like boats, but they're called spaceships. Has anyone told you about that yet? Some of those may not even be real stars anymore. It takes billions of years for the light to reach us. So long that the star might already be gone, yet we can still see its light and admire it.. It's a big world out here, Flowey, and it's an even bigger universe out there. Everyone, no matter how small, are just trying to find their place in it. Unfortunately, though some of us would be happy to let you leave if that's what you think will make you happy, it's just... I don't think Frisk will have the same ideas. They are too determined to help you in their own way, though you do need a break. How about this Flowey: You can go where you like, whether that be around the block or the next town over or wherever on one condition. You have to take us with you. We don't want you to be left all alone and I get the feeling you don't really want to be alone either. We also want to make sure you stay safe during your travels. What do you say, pal? Flowey's not feeling so good right now. Does it bother that much to repeat a day, Frisk? Frisk, this might be hard to do... But maybe you should let Flowey live with the consequences of his actions? Frisk? Flowey wants a bigger pot. I think Flowey needs some space, or....go to the park?